Beijing will tout its two indigenous military aviation platforms at the 2016 Zhuhai airshow. China is set to show off its J-31 advanced stealth fighter and Y-20 heavy transport aircraft later this year at a trade show. According to Xinhua, China’s state-owned news agency, the Aviation Industry Corp. (AVIC) of China, a major state-owned defense aviation enterprise, will feature the two aircraft prominently at the upcoming 11th China International Aviation and Aerospace Exhibition in the southern city of Zhuhai, in Guangdong province. The show will open on November 1. The two aircraft are built by AVIC subsidiaries; the J-31 (also known as the “Gyrfalcon”) is built by Shenyang Aircraft Corporation and the Y-20 (codenamed the Kunpeng and nicknamed “Chubby Girl”) by Xian Aircraft Industrial Corporation. The Y-20 was introduced into service with China’s People’s Liberation Army-Air Force (PLAAF) earlier this summer while the J-31 is set to enter service with the PLAAF in roughly two to three years by most independent estimates. Both aircraft fulfill drastically different strategic roles for the PLAAF. The Y-20 will abet Chinese expeditionary military operations with heavy transport and strategic airlift duties, much like the U.S. and the J-31 serving an agile multirole function, much like the U.S. C-117 Globemaster and Soviet Antonov An-70. F-35 Lightning Joint Strike Fighter. Indeed, the design of the J-31 is believed to have been the product of industrial espionage of the F-35. The two aircraft share common hardware elements, including a similar airframe design and two internal weapons bays. 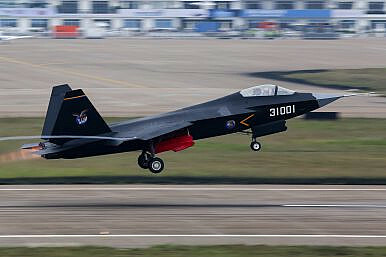 Though much the aircraft’s detailed specifications remain publicly unknown, aviation experts estimate that the J-31 features inferior avionics to the F-35. Is China Rethinking the Shenyang J-31 Fighter?China Stations Combat Aircraft on South China Sea IslandRussia Completes Delivery of 24 Su-35 Fighter Jets to ChinaJapan Scrambles Fighter Jets to Intercept 4 Chinese Bombers Over East China SeaHow Does China’s Air Force Learn and Adapt to New Circumstances?